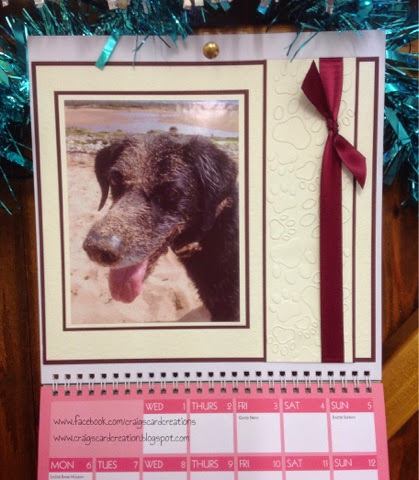 Crafting With Craig: Stix2 Create your own Calendar - April 2015. Stix2 Create your own Calendar - April 2015. Good evening, Well its a late night for me tonight. As i am blogging i am attempting to stay up and cheer on Philip Schofield with his Text Santa 24 hour live feed. I am a big fan of Phil and i have been really enjoying it. will i be able to stay up? I dont know but i am taken this opportunity to get as much work as possible and typing some blog entries. 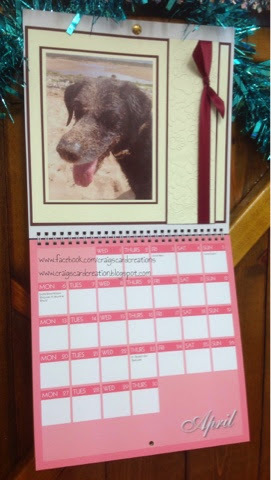 So i am on the final stretch of this years create your own calendar. I am now onto April. like previous entries, i wanted to show that you can still create a lovely looking page with out lots of things being added. Matting and layering, bit of embossing and you have a lovely looking page. I do love the combination of wine coloured card and ivory/cream. just think it matches so well. Whether its a card, scrapbook page or material - it always is a match made in heaven. 16mm Wine satin ribbon - S57216. Dog paw embossing folder - Darice, Crafters Companion. Create your own calendar 2015 May.